Feedback from special school teachers refers not just to the training being excellent and a chance to focus on the core of teaching and learning but also on the impact they have seen since the training started. In particular referring to a developing more independent learning in students and seeing them putting things in practice sooner and demonstrating their learning. The TEEP programme, whilst being suitable to all stages and ages of young people, does have the ability to be tailored specifically for the needs of special schools. This is why we believe that TEEP is a holistic approach for any special school interested in enhancing their teaching and learning. The increasingly complex and varying nature of student needs being admitted to special schools. This challenges the skills and experience of teaching staff and existing approaches to curriculum planning. TEEP is a framework with a strong pedagogical foundation, to support a consistent approach to teaching and learning whilst allowing for the delivery of personalised learning experiences to meet the unique needs of your students. Effective intervention is at the heart of special school provision, your commitment to supporting students’ complex needs and ensuring their progress, and the preparation of these students for adulthood. TEEP focuses on three components which reflect the essence of excellence in special schools: effective teacher behaviours and effective learner behaviours; the five underpinning elements of effective practice; the TEEP learning cycle. The TEEP model identifies four areas where teachers will benefit from being explicitly aware of how the decisions they make can impact their students’ learning: this reflects the essence of excellence in special schools. Equal value is given to the significance of understanding of how to empower even the most vulnerable pupils in the learning process, taking account of their profiles and specialised needs. TEEP sets out five underpinning elements to support teachers to present a relevant and accessible curriculum to their students, as part of the learning process. 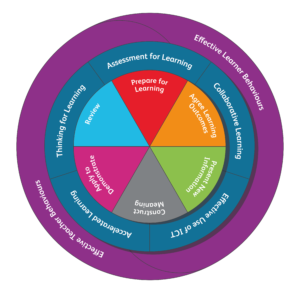 The elements act as the conduit between what the teacher and the learner has to do (to teach and learn the curriculum content, throughout the cycle), and how they go about it (the teaching and learning behaviours they will employ). Special schools may choose to either have whole-school training, for all the teachers in their school at the same time, or for individual practitioners to attend open courses.